BMW ownership can be a tremendously rewarding experience, and if you own one, you probably know BMWs require proper care to perform at their best on the road. The marque carries an undeserved reputation for reliability issues to the uninitiated, but like any car, your BMW will require the occasional repair or service. You can perform many of these tasks yourself, provided you’ve got some basic mechanical knowledge, the right tools and a little patience. Those who wrench often will discover quickly that easy access to your car’s undercarriage can make jobs infinitely simpler. That’s why investing in a lift is a great decision if you plan on doing lots of work on your BMW. Cost is probably the first thing that comes to mind when you think about installing a lift in your garage. You might not know it, but lifts are cheaper to buy today than they ever have been. Consumer interest from people like you has driven the development of home-use models that offer a great value for DIYers. You spend anywhere between $3,000 and $10,000 for a good lift, depending on the features you want. That might sound like a lot, but consider the length of time you’ll have the lift, the repairs it will allow you to perform, and the time you’ll save, and you begin to understand where you make your money back. Not every lift is the same. There are many different configurations. Some include two- and four-post lifts, and scissor-type lifts. Within these categories are variations on where the lift engages, the wheels vs. the frame of the car, and how the lift is installed in your workspace. To perform repairs, you will want to choose a lift that has the proper safety certifications and offers good access to suspension components. Speaking of access to your undercarriage, that’s the biggest perk of owning a lift. The time you spend replacing an A-arm or adjusting your camber plates is cut in half when you can move freely and avoid the hassle of sliding around on your back. 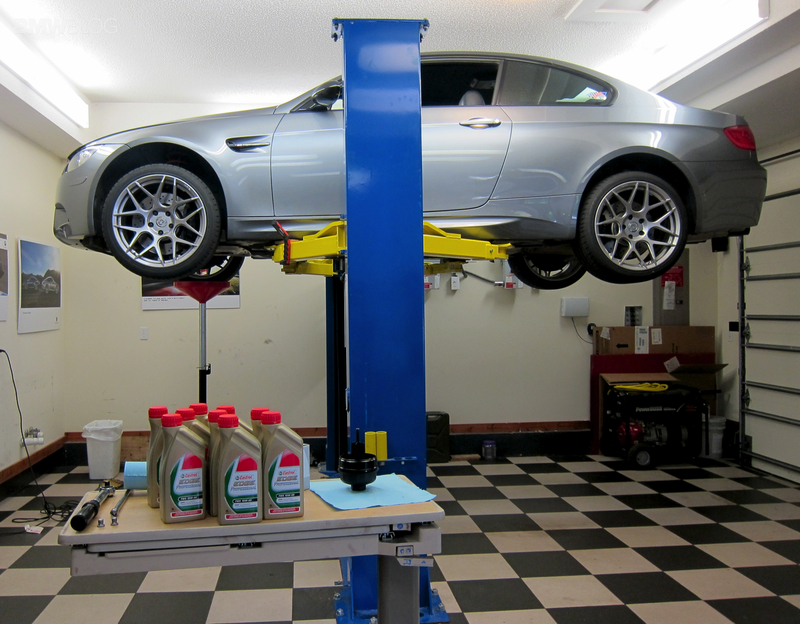 Compared to working on a car on jack stands, a lift provides a vast improvement in safety. You’ll never bump your car off of a lift by accident, and the distributed load will not cause dents in the unibody or jacking points of your vehicle. Your health is another great reason to avoid spending all that time bending over and sliding around on the garage floor. The price of a lift is nothing compared to what you could end up spending in medical bills if you damage your back working on the Bimmer. 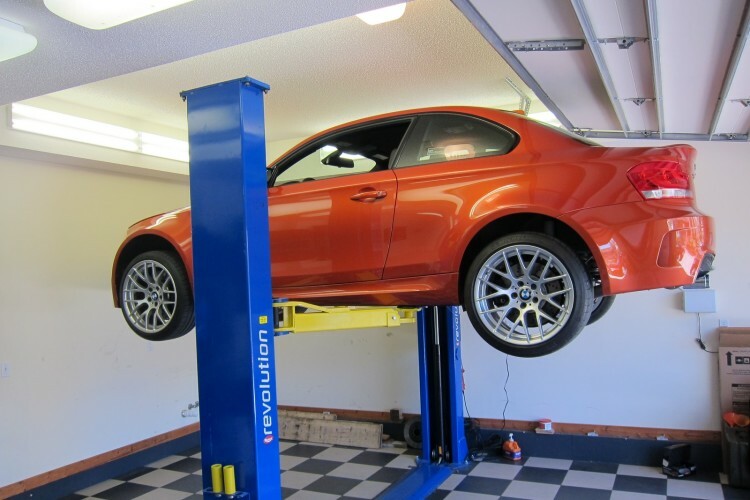 With affordable options for the consumer, installing a lift is, in fact, a very sensible thing to do if you enjoy working on your BMW. No other solution allows you to more quickly diagnose and repair an issue you just noticed during a quick drive. Lifts can have fringe benefits, too. You can use them to get cars out of the way and free up garage space, or store other items out of the way when not wrenching. You can even do work on friends’ cars with them — but hey, we’re not signing you up for any extra commitments here.